Although I routinely purchase and try out many different notebooks for my own use, this post marks the first time I have put pen to paper and committed my thoughts to a more formal review. What makes me qualified to provide an opinion? Nothing other than a keen interest in all things pen and paper, a willingness to document the writing experience and features of this particular product, and a good few years of being a little obsessive about which pens I use and the paper products they are used on. Why the Ogami first up? The search for something a little different is probably the most accurate answer here. The Ogami Stone Paper Notebook fits the brief well, given the unusual composition of the paper itself (more on this below). The manufacturer also lists a number of advantages in using Repap over traditional paper, primarily the environmental benefit (it is “tree free”, uses less overall energy in production and is recyclable). Other benefits are said to include water resistance, greater durability than traditional paper, and its softness, having none of the hard edges or corners of traditional paper – that is “paper-cut free”. Although the environment should be a concern, or at least a consideration for all of us, I am not about to debate the environmental merits of the Repap production technology over more traditional means, such as sustainable forest planting for paper production. There do appear to be environmental advantages in the Repap process, however in providing a balanced view, there are those that question the claims of such a product. Ogami have produced an attractive product, which does not look out of place on a shelf next to a Moleskine cahier of identical size. In fact they look quite similar, as you can see from the cover image. This is probably where the similarity ends. It is probably worth mentioning here that the similarity certainly ends when it comes to price. The Regular Ogami professional model of this review was purchased at a local bookstore for AUD$14.99. 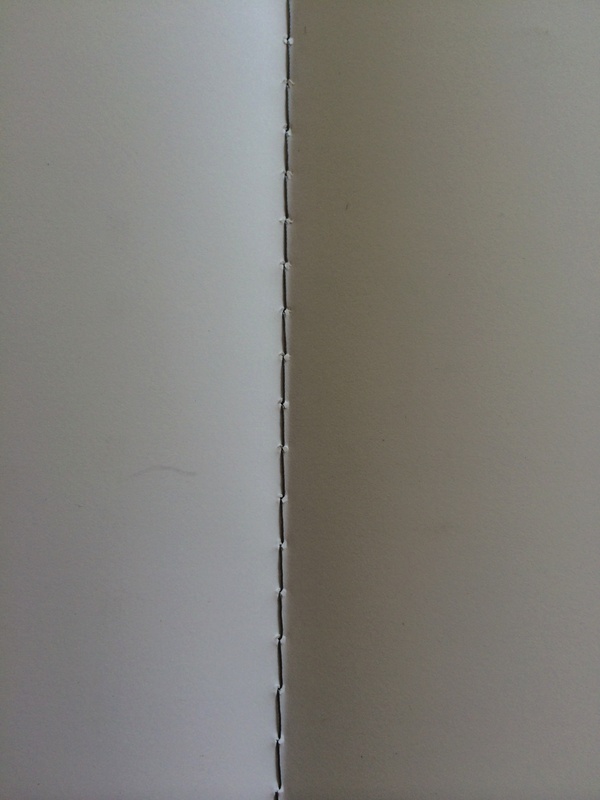 A three pack of Moleskine Cahiers the same size from the next shelf along are AUD$18.95. It goes without saying there needs to be a fairly compelling reason to pay what is almost 3 times the price of a more readily available competitor. Does the Ogami achieve this? For me, not quite. Although not specifically a Moleskine vs Ogami review, compared to the Moleskine, the cover is much stiffer, whilst the paper is much softer, both around the edges and across the face of each sheet. The feel of the paper is akin to an extremely smooth hard surface when running your finger across the surface (like polished wood or tile). However, with any sort of point pressure, you tend to “sink in” to the surface (think vinyl table protector). This may not suit every type of writer, particularly those who may be a little heavy-handed at times (it is I you see looking in the mirror as I write that sentence). The Repap paper is indeed very different to what you feel in a traditionally made paper. 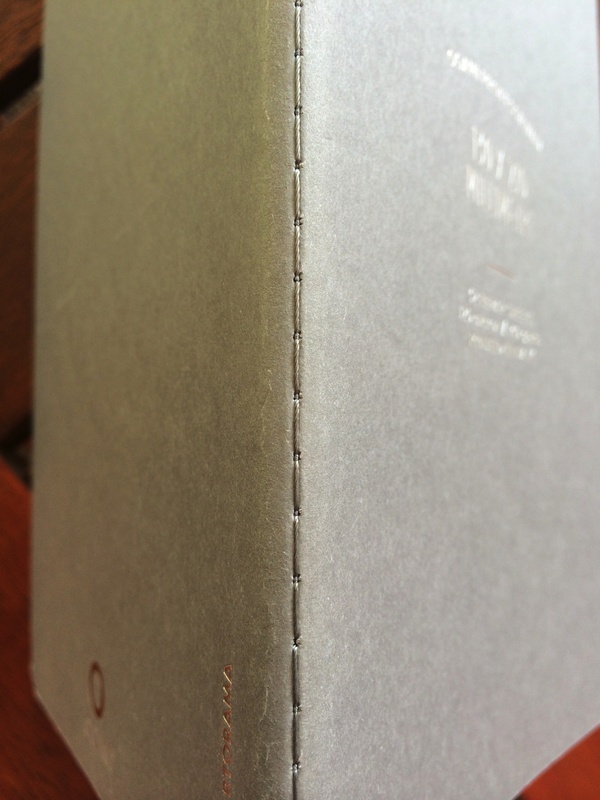 Probably my only issue with the overall aesthetics (and a minor one) is that although the notebook will sit flat when opened, once the spine is “broken in”, the cover sits at approximately 30–45 degrees open when the book is closed and sitting flat on a desk. This is most likely due to the stiffness of the cover I expect, however is something that annoys me a little, requiring an object to be placed on top for the cover to sit fully closed, though I acknowledge this may change as the spine ages. Does this notebook feel any more “premium” than similar sized and designed products due to the silky smooth pages and stiffer cover material? Perhaps a little, although the manufacturers emphasis appears to be on the features and environmental benefits, however given the price, I think any advantage would be welcome. I very much like the look of the grey stitching on the white paper through the centre fold, which although is merely maintaining a uniform colour from the outside, looks great nonetheless (contrasting stitching on the outside would look great too – say in black perhaps?). 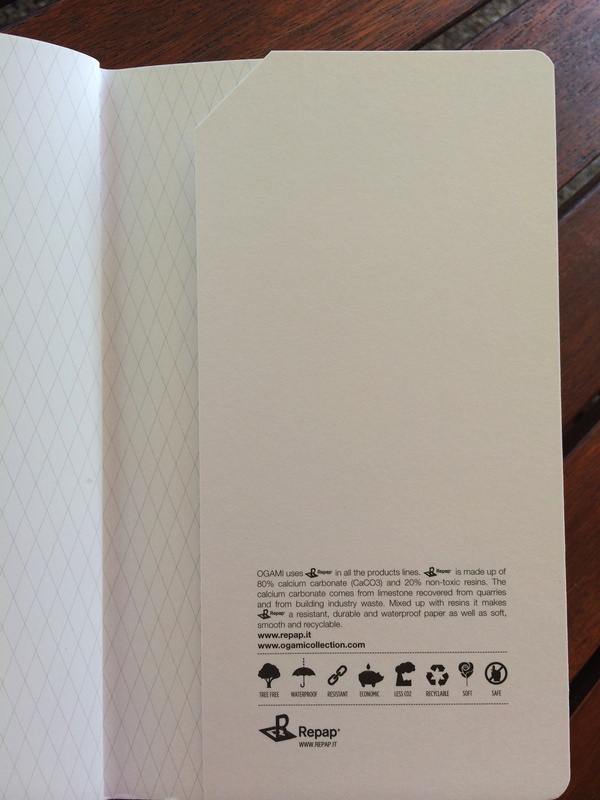 I am also a fan of the bright white paper, which is much nicer than the yellow of the Moleskine. So – what really counts. 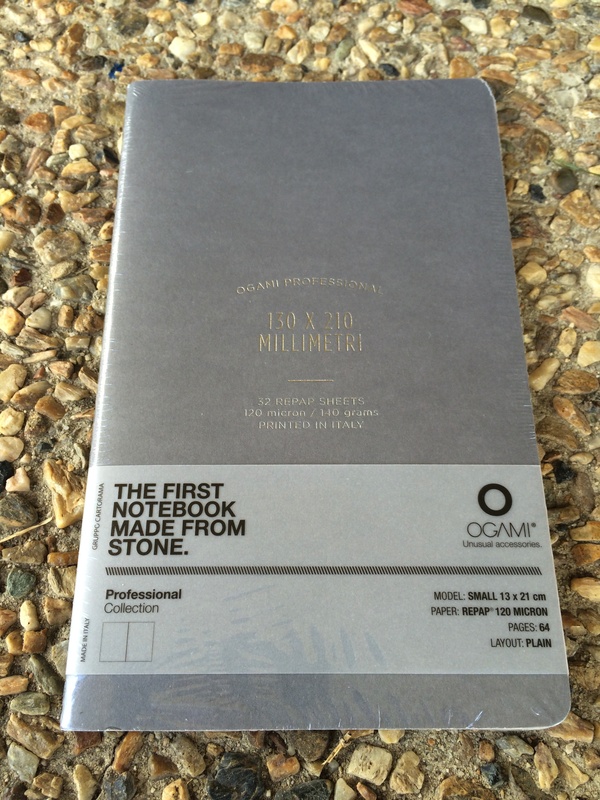 How does it feel to write on this stone paper – like a stick on a stone tablet? Far from it, and whether or not this notebook is for you will be a very individual decision (as they all are), and will largely depend on your particular writing style. 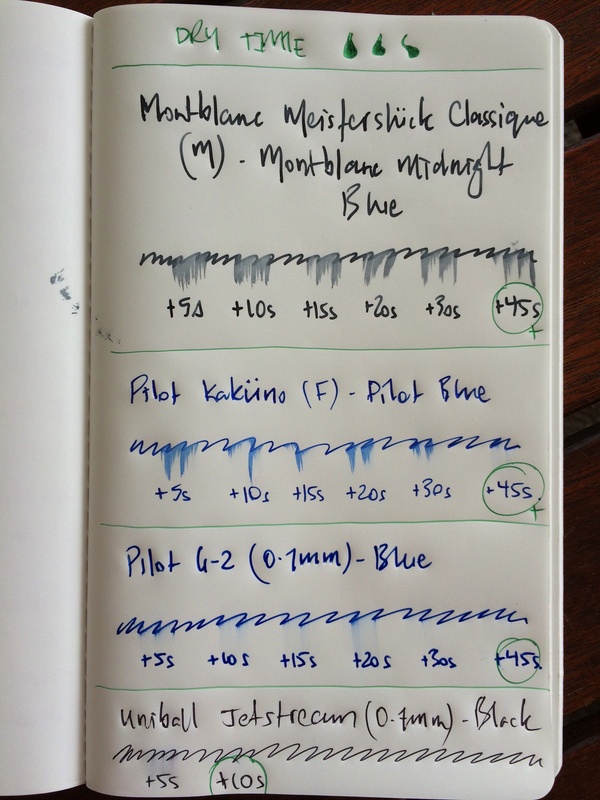 The most obvious point to make here is fountain pen drying time, which, depending on nib size and ink, will run to at least 45 seconds, as was the case with my Montblanc Meisterstuck (M; Montblanc Midnight Blue) and my son’s Pilot Kakuno (F). Not a disaster, however a significant consideration for how you may use the notebook, to the extent I would consider it essentially ballpoint only. No discernible feathering or bleed was evident, as the ink laid down seems to dry “on” rather than being absorbed “in” to the paper. I suspect the relatively non-porous nature of the paper is where the durability and water resistance are derived, however as you can expect, has significant ramifications for ink drying time. 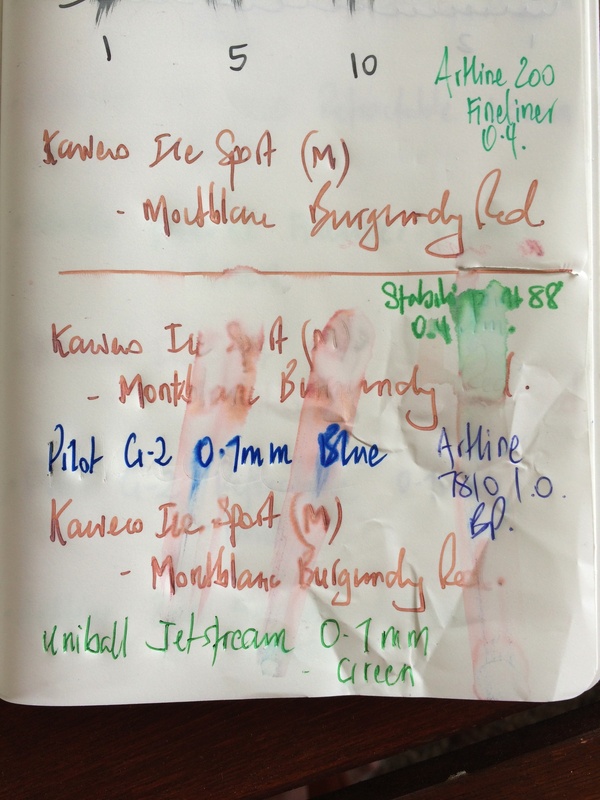 Gel and ball point inks fared well, however those on the wetter side (Pilot G–2 0.7mm) required approximately 20-30 seconds to avoid significant smudging, and up to 45 seconds to fully dry. Felt tip fine-liners of 0.4mm, and a 0.7mm Jetstream dried immediately and smudge free, unless I waged a very strong fingered smear campaign. Another possible deal-breaker for many. If you are at all heavy-handed, regardless of pen type, you will sink a little into this paper, and feel as though you are pushing a wave of paper in front of you. Probably the best way I can think to describe it is when writing on the fresh, clean, right side of the notebook, it feels similar to writing on the left (reverse) side of other notebooks about 10 or so pages in. 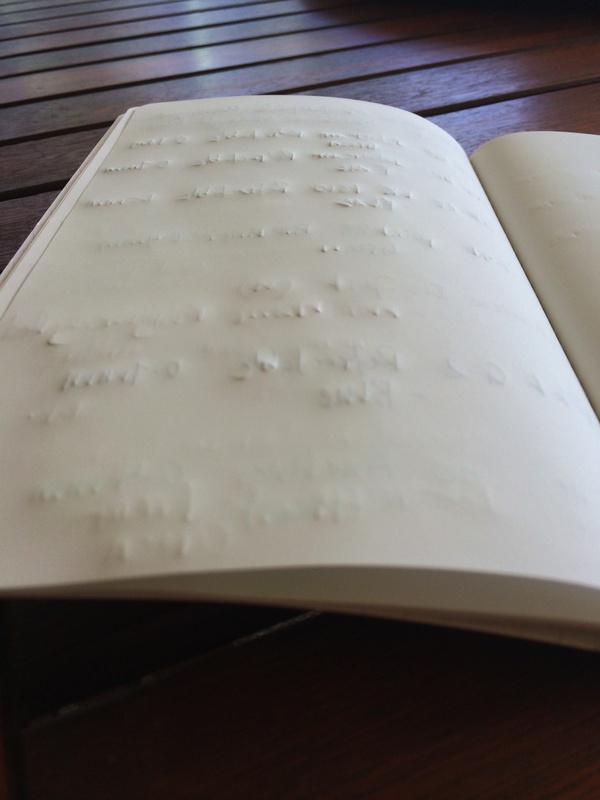 You can see how this effect would be magnified when you actually are writing on the reverse side of this paper half-way through the notebook. The effect of pressure can be seen fairly markedly in the image of the reverse side of the paper. Although this will vary for each individual writing style, for me personally it is a limitation. As noted above, the manufacturer of Repap paper claims an advantage over other forms of paper in terms of resistance to tearing, water and overall durability. Testing these claims demonstrated a reasonably strong tear resistance at the edge of the sheet, however once the outer edge gave way, the sheet “split” down or across the page fairly easily (see right edge of page at the horizontal line in the image below). It is certainly not the type of notebook you will be tearing sheets out of with any sort of regularity. Running a finger dipped in water down the page significantly smudged all words written 7 days prior (see bottom half of page in image below), with the exception of a ball point, so (though perhaps obvious) unless you intend to write with a ball point, I do not believe the resistance to water, and suitability to high humidity conditions (as quoted by the manufacturer) should really be a relevant factor in your purchasing decision. After a week in my bag, some early signs of wear are showing at the ends of the spine, with a little of the grey colouring of the cover beginning to come away. Combat page – water and tear testing. In retrospect, it’s probably a little unusual for me to purchase a notebook of this size, as I tend to use a smaller pocket variety (Field Notes), or the Extra Large sized cahier type notebooks which I carry in my bag, and on my desk, a Rhodia No. 16 Dot Pad. However, at the time it was the most reasonably priced version of the Ogami range in the store to buy purely for testing. Notwithstanding the above, I can see this notebook put to good use in meetings, as an idea journal/planning tool, or even a daily record keeping journal. The cover has a good stiffness and solid feel to it which should protect the contents well. However, the paper may limit some users intending to write for any length of time in longhand, as the softness of the paper (in an ironic twist despite its smoothness) may be hard going over a longer period of writing. As I have mentioned, this would be the case mainly for those a little heavy-handed or perhaps using finer nib or tip sizes. 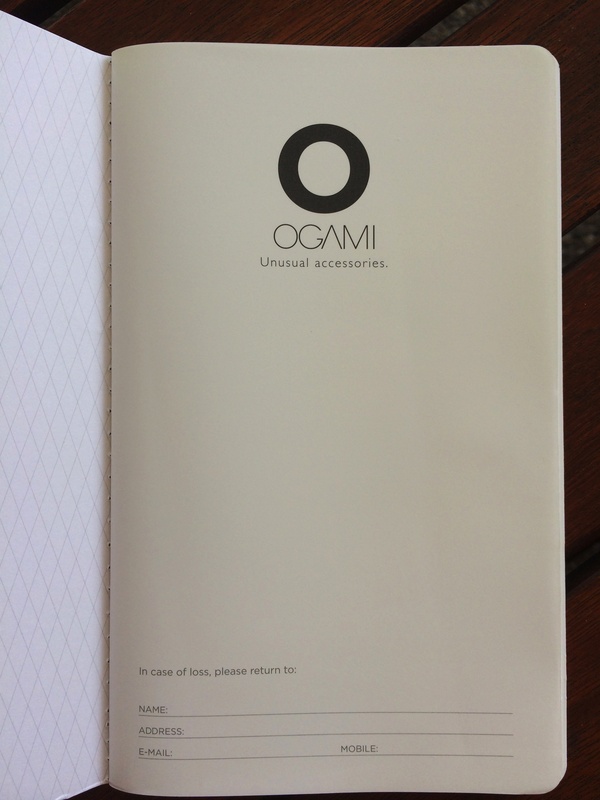 Would I buy and continue to use an Ogami notebook? Probably unlikely. Don’t get me wrong, this is a product on par as far as quality is concerned with those similar in the marketplace (though a little more expensive), however for my particular writing style, is not the best fit. In particular, as I can tend to be a little heavy-handed with pressure, the soft nature of the paper requires me to push a little harder on forward strokes. I acknowledge this to be a limitation of my writing style, however I write the way I write, and will obviously find products to suit. Secondly, the Repap paper is really not designed for fountain pens, nor wetter gel or liquid inks, and I personally would consider this a ballpoint (or pencil) only notebook. So, who should buy one? I would say users of fine tipped gel or preferably ballpoint pens. Those with a light (and perhaps right) hand who intend to use the notebook for short periods of writing, such as mind maps, lists or short journal entries. Or of course if you are in any way like me and are curious as to how this form of paper may suit you. Grab one and try it out. Great review! I’ve been contemplating these notebooks for some time and may pick one up for the novelty factor. Waterproof paper is always a good thing to have on hand! Thanks! 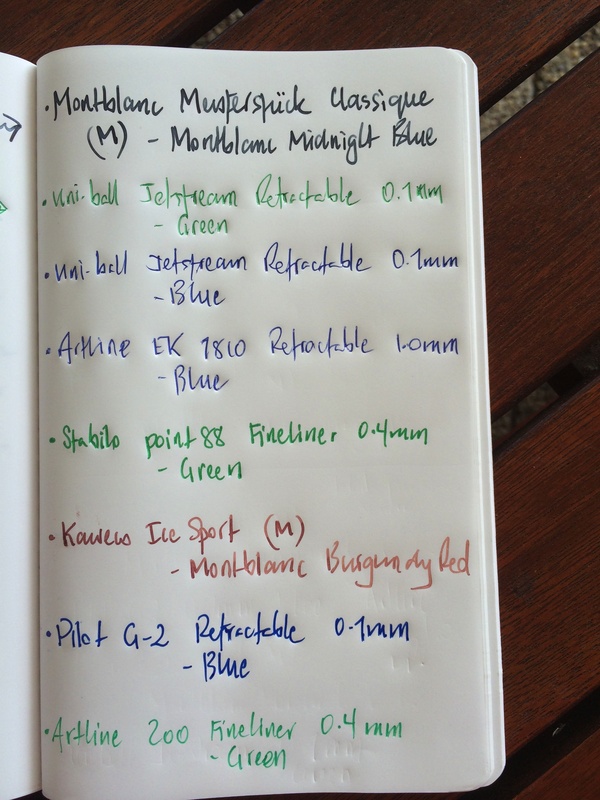 Despite suiting certain pen types better than others, it is quite a good notebook overall.